Apprising Ministries continues documenting the sad slide of evanjellyfish deeper into apostasy as spiritual darkness grows. In the Lord I’m telling you, as one Jesus sent as a pastor-teacher, that one of the most important of these teachings of demons being spread right now is false understanding of Christian unity. There is a spiritual form of fascism being perpetrated now within the mainstream of the church visible. It began circa 1997 with the hatching in hell of the neo-liberal cult of the Emergent Church aka the Emerging Church and spreads its evil spores via Contemplative Spirituality/Mysticism (CSM). 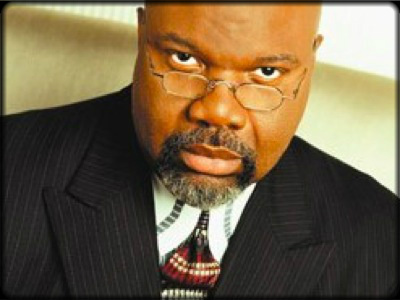 You’re about to see the condescending attitude of celebrity Prophet-Führers and their unity over doctrine mantra. I’ve pointed out that in violation of God’s Word James MacDonald and ER2 co-host Mark Driscoll, members of the Gospel Coalition Council, have opened a forum for Word Faith heretic T.D. Jakes. You need to know this is actually a red herring concerning unity and a straw man argument regarding the cardinal doctrine of the Holy Trinity. There’s no one credible who’s even saying that salvation is based solely upon that doctrine. The point is: The Bible—God’s Word— teaches it, and so, we must believe it. Today it’s become of paramount importance to get people to define their terms. From my years of studying cults and Comparative Religion I can tell you that Jakes’ statement of belief above is terribly insufficient. For example, the same can be stated by practicing modalists—or even Jehovah’s Witnesses and Mormons. Because I don’t take this personally, let’s leave aside his referring to me as one who shared “obnoxious communications” and is now blocking me. It’s part of my ministry here at AM to come directly at issues, and the Lord has blessed it in that I’m able to talk with the very people whose work I am led to criticize. As far as I can see, T.D. 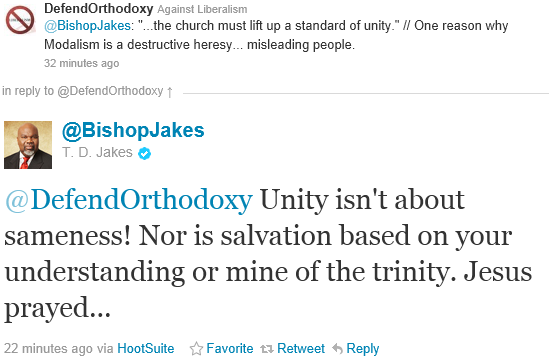 Jakes is a spiritual coward and compromiser who would walk in between those who teach the Trinity of the historic orthodox Christian Church and those who hold the heresy of Oneness Pentecostalism. There’s no way around it because the question I asked was very carefully defined. Which God are you talking about? 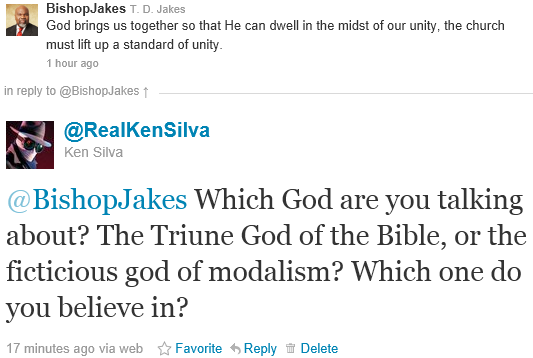 The Triune God of the Bible, or the fictitious god of modalism? Which one do you believe in? 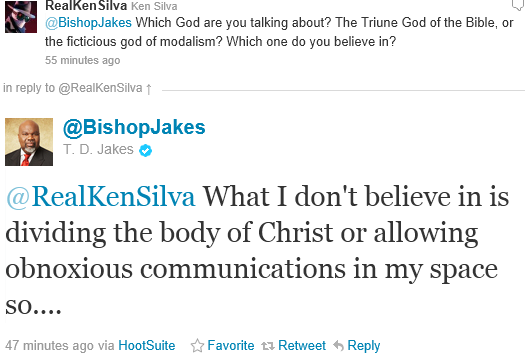 believe in is dividing the body of Christ. Yet another aspect of Modalistic Monarchianism / Modalism / Sabellianism is Patripassianism, which is the view that it was God the Father who became incarnate, suffered, died, and was resurrected. Patripassianism essentially teaches that God the Father became His own Son. watch out for those who cause divisions and create obstacles contrary to the doctrine that you have been taught; avoid them. For such persons do not serve our Lord Christ, but their own appetites, and by smooth talk and flattery they deceive the hearts of the naive.